NTP 4.2.7p241 - The best Windows NTP ever? In December 2011 I made some tests with a near-to-release version of NTP (4.2.7p238), to see how it compared with earlier versions, and how well it worked on different versions of Windows. 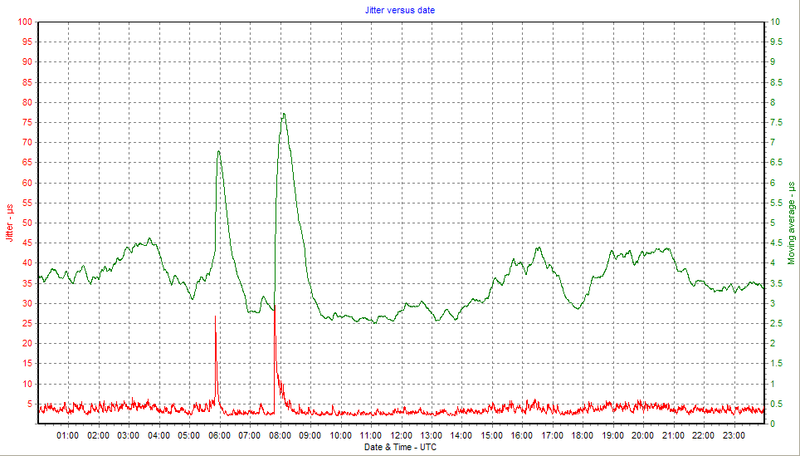 There is a detailed table of events below, and graphs of the Offset, Frequency and Jitter reported by NTP. You can roll your mouse over the captions below the graphs to select a different graph to view. These results and my conclusions are pending discussions with NTP experts. I had the chance to test a slightly more recent beta (4.2.7p241) on 2011-Dec-19, which has significantly improved how well NTP works on some Windows systems, now providing an almost uniformly excellent performance. My thanks to Dave Hart for his tireless work on NTP for Windows. Extracts from the Windows Event Viewer are zipped here. * [Bug 2015] Overriding sys_tick should recalculate sys_precision. * [Bug 2037] Fuzzed non-interpolated clock may decrease. * [Bug 2068] "tos ceiling" default and cap changed to 15. * Floor peer delay using system precision, as with jitter, reflecting inability to measure shorter intervals. and I recall that it was the change to the calculation of floor peer delay which resulted in the improvement on Windows Vista and later systems. This change has been kept for subsequent NTP versions. 4.2.7p241 works well in all versions tested, and there is now no need for the earlier 4.2.4p6 (273). PCs running Vista or Windows-7 benefit from the new version. Two Windows-7 portables tested work better with LAN sync than Wi-Fi (PCs Torvik and Ystad). PCs running PPS sources saw little on no noticeable change (PCs Alta, Bacchus, Feenix and Stamsund). One PC running Windows-XP is unaffected by the change (PC Narvik). Why is the Wi-Fi sync worse on the Windows-7 Wi-Fi connected portables? 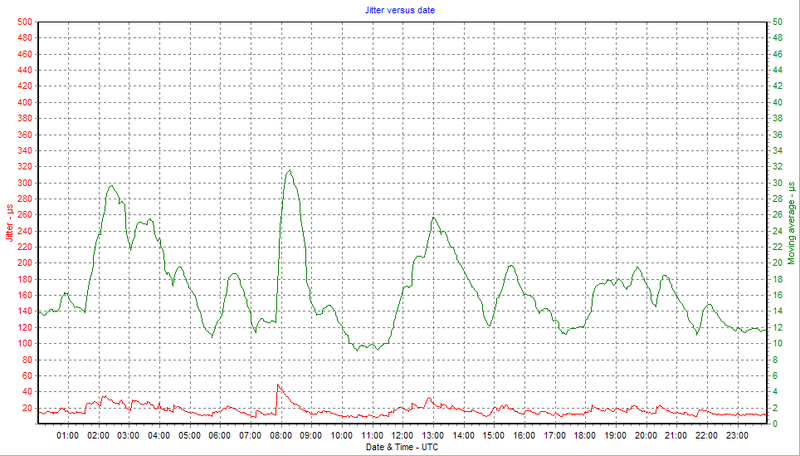 The two Vista Wi-Fi connected systems do significantly better, albeit not as good as the LAN-connected machines. But it suggests that the Windows-7 PCs should be able to do better. Jitter 20-60 �s, average 30 �s. Offset +/-70 �s. 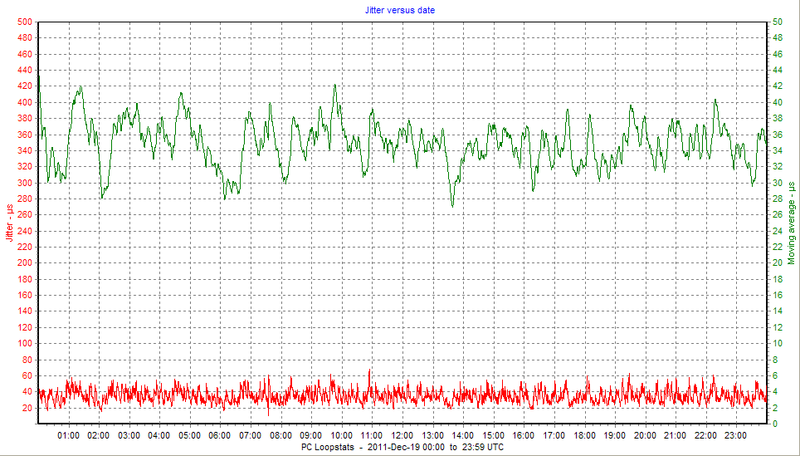 09:59 To: ntpd 4.2.7p241-o Dec 18 22:57:49.91 (UTC-00:00) 2011 (1) No noticeable changes Jitter 22-36 �s, average 30 �s. Offset +/- 70 �s. Jitter 15-60 �s, average 36 �s. 07:33 To: ntpd 4.2.7p241-o Dec 18 22:57:49.91 (UTC-00:00) 2011 (1) No noticeable changes. Jitter 28-42 �s, average 34 �s. Offsets became wild and jitter increased a lot. Offsets became wild, increasing from about +/- 1.5 ms to +7/-10 ms.
Jitter increased from ~1 ms to ~6 ms.
15:25 Set NTPD_USE_INTERP_DANGEROUS=1 Slight reduction in jitter? 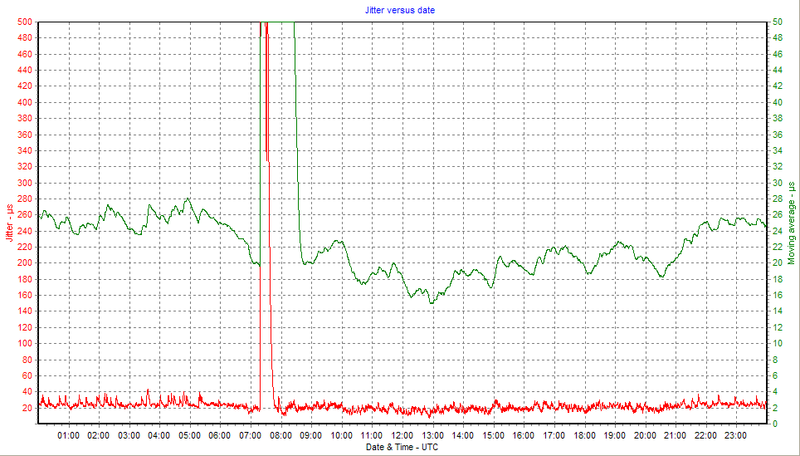 Jitter dropped to a maximum of ~4-5 ms.
16:41 Set NTPD_USE_SYSTEM_CLOCK=1 Jitter increase. 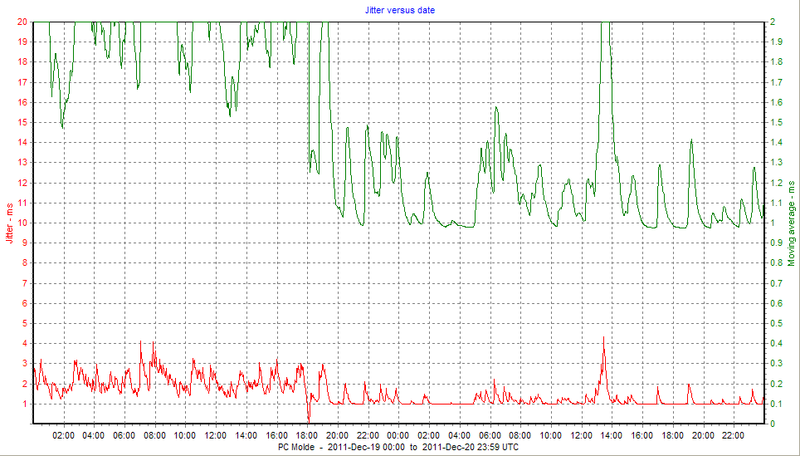 Jitter back to 5-6-7 ms.
19:11 Reverted to: ntpd 4.2.4p6@DLH-QPC-o May 30 3:58:32.88 (UTC) 2009 (273) Jitter and offset reverted to previous values. Jitter just over 1 ms average, offset about +/- 1.5 ms.
14:23 To: ntpd 4.2.7p241-o Dec 18 22:57:49.91 (UTC-00:00) 2011 (1) No noticeable change from the previous "good" version. Jitter 1.2-1.7 ms, average ~1.4ms. Offset reduced slightly to +/- 0.9 ms, but with occasional spikes to +/- 2 ms.
11:20 To: ntpd 4.2.7p241-o Dec 18 22:57:49.91 (UTC-00:00) 2011 (1) No significant effect. The averaged jitter may have increased slightly from 3.5 �s to 3.7 �s. Offset +/- 60 �s but over a much more limited period. 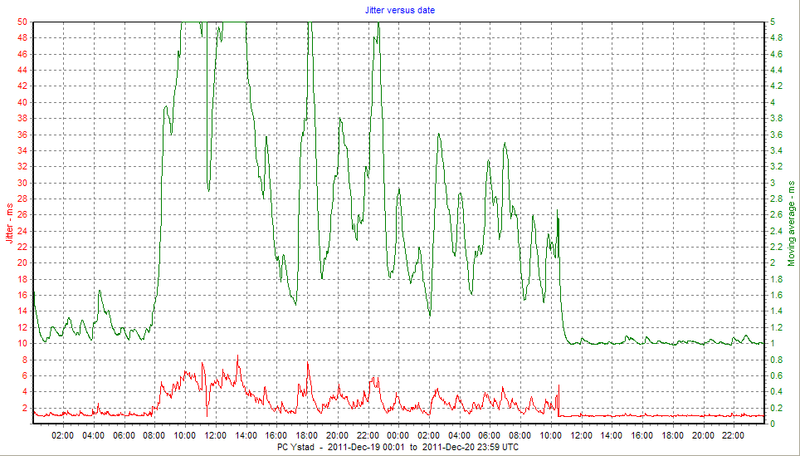 To: ntpd 4.2.7p238-o Dec 10 4:46:28.43 (UTC-00:00) 2011 (1) Jitter increased from a peaky 1-7 ms, to a variable 4-9 ms. Offset changed from a about 1 ms "noise" with positive-only peaks up to 37 ms, to tens of milliseconds of a lower frequency "noise" with peaks to +50/-17 ms.
15:23 Set NTPD_USE_INTERP_DANGEROUS=1 Rather short to be sure, but jitter slightly worse. 16:44 Set NTPD_USE_SYSTEM_CLOCK=1 Jitter possibly worse at 8-18 ms. Peaky? 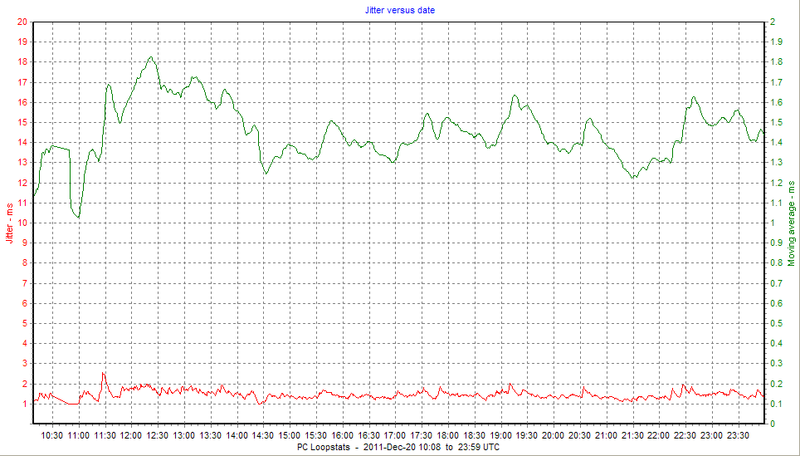 19:19 Reverted to ntpd 4.2.7p214-o Sep 21 2:47:14.56 (UTC-00:00) 2011 (1) Previous performance not restored. Why not? 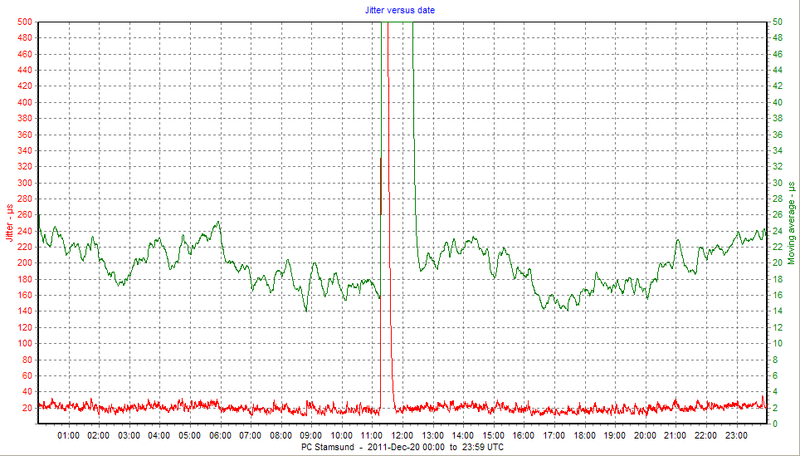 Jitter 6-13 ms.
09:15 Removed NTPD_USE_SYSTEM_CLOCK and restarted NTP. 17:51 To: ntpd 4.2.7p241-o Dec 18 22:57:49.91 (UTC-00:00) 2011 (1) Averaged jitter much reduced, from ~7.5 ms to ~2.5 ms, but still quite peaky. 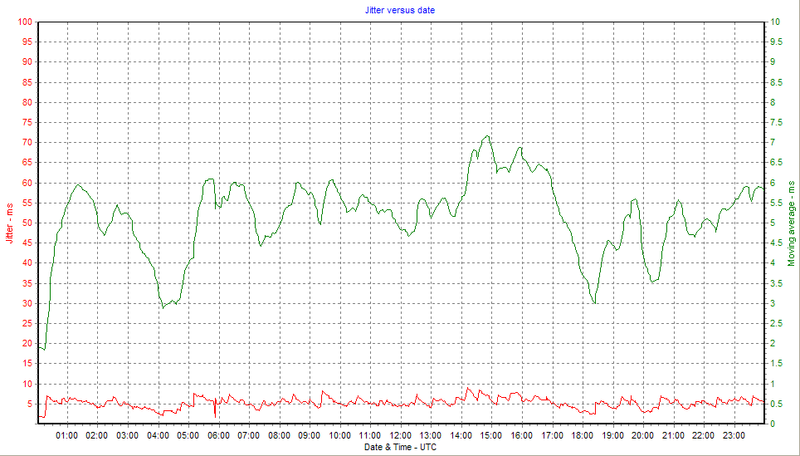 Offset considerably different; periods of near-steady values with peaks. The peaks were likely present before, but not as visible as the offset was noisier. To: ntpd 4.2.7p238-o Dec 10 4:46:28.43 (UTC-00:00) 2011 (1) No change detected. Average jitter 4-6ms, offset variable with asymmetry, +14/-8 ms. Hints of a 17-minute periodicity, but also with a two sine-wave interference pattern. ntpd 4.2.4p6@DLH-QPC-o May 30 3:58:32.88 (UTC) 2009 (273) Much better. Jitter drop to 1.1 ms. Offset now a random +/- ~1ms. 18:25 To: ntpd 4.2.7p241-o Dec 18 22:57:49.91 (UTC-00:00) 2011 (1) Even better than (273). Averaged jitter under 1 ms. RMS offset dropped from ~0.5 ms to ~0.3 ms.
To: ntpd 4.2.7p241-o Dec 18 22:57:49.91 (UTC-00:00) 2011 (1) Very similar to (273). 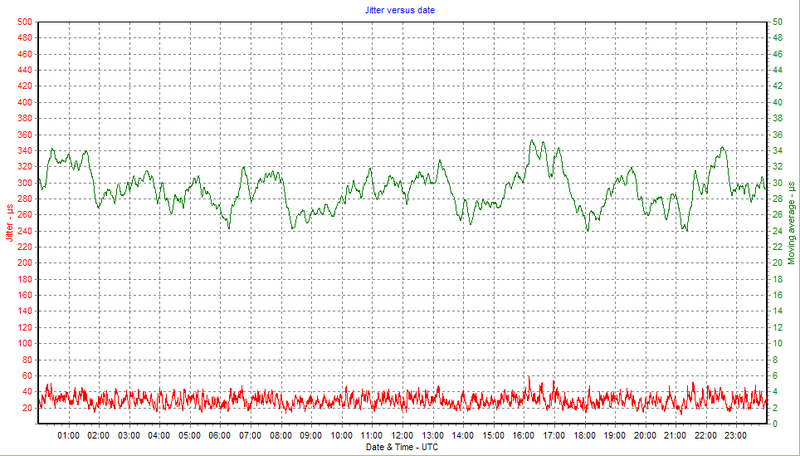 Averaged jitter perhaps dropped a little, from 9.5 to 8.5 ms, but still stabilising. 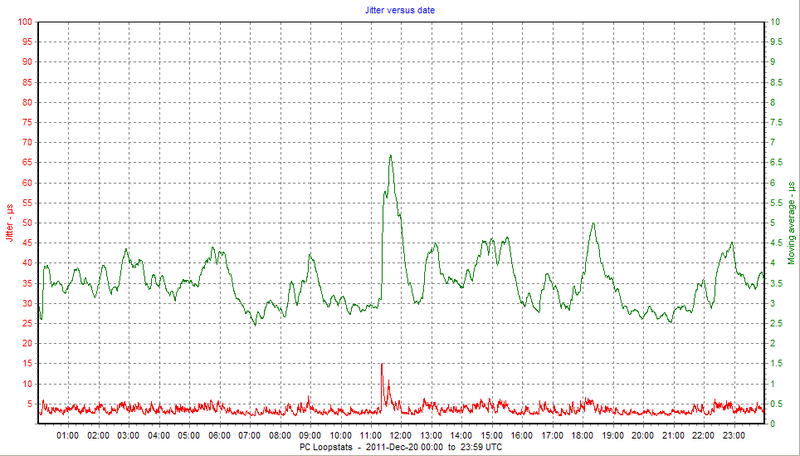 Offset changed to a coarser (lower-frequency) pattern, with greater excursions (typically was +13/-7 ms, now +20/-5 ms). 14:00 Tried a direct LAN connection. (Not plotted) The averaged jitter increased from ~7 ms to just over 10 ms. 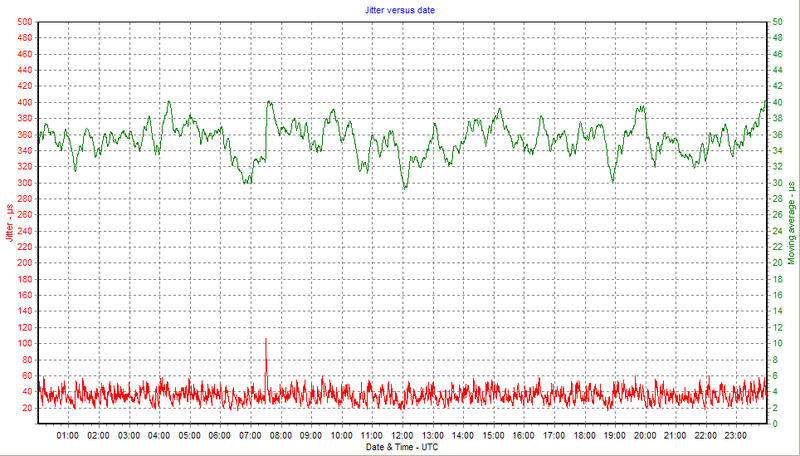 Offset changed to a much higher frequency pattern, with +6/-11 ms typical limits. Surprised that jitter became worse! To: ntpd 4.2.7p241-o Dec 18 22:57:49.91 (UTC-00:00) 2011 (1) Noted that precision had been determined as 2^-21s, hence the restart. Averaged jitter down from ~2 ms to often 1 ms. RMS offset reduced from ~1.5 ms to ~0.5 ms, but still quite variable with transients. 18:11 Set NTPD_USE_SYSTEM_CLOCK=1 and restarted NTP. Improvement. To: ntpd 4.2.7p238-o Dec 10 4:46:28.43 (UTC-00:00) 2011 (1) No change noted. Averaged jitter 10..30 �s. Offset +320/-210 �s, random. 07:17 To: ntpd 4.2.7p241-o Dec 18 22:57:49.91 (UTC-00:00) 2011 (1) No significant change. Averaged jitter 10-26 �s. ~15 �s average. Offset +350/-210 �s. 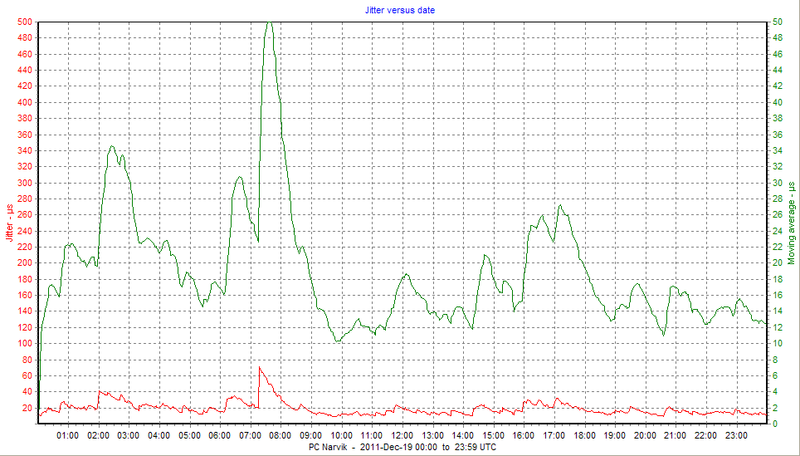 To: ntpd 4.2.7p238-o Dec 10 4:46:28.43 (UTC-00:00) 2011 (1) Slight jitter increase. Averaged jitter increased from ~5.5 ms to ~7 ms. Elements of 10 minute periodicity in the offset before and after the change. 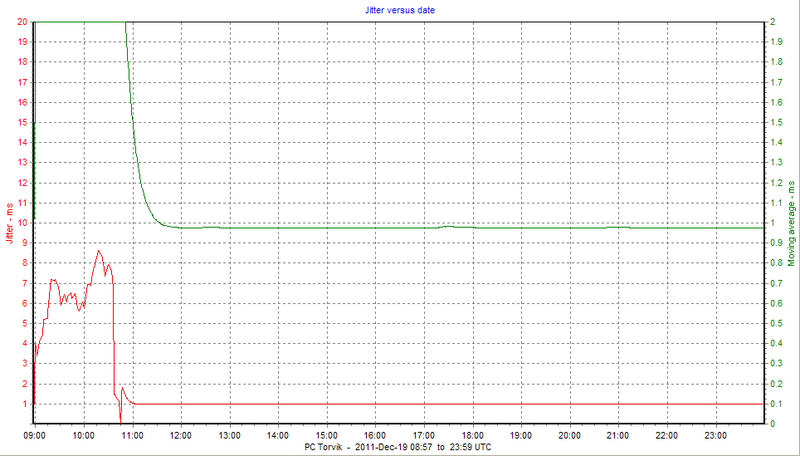 10:50 To: ntpd 4.2.7p241-o Dec 18 22:57:49.91 (UTC-00:00) 2011 (1) Great improvement. 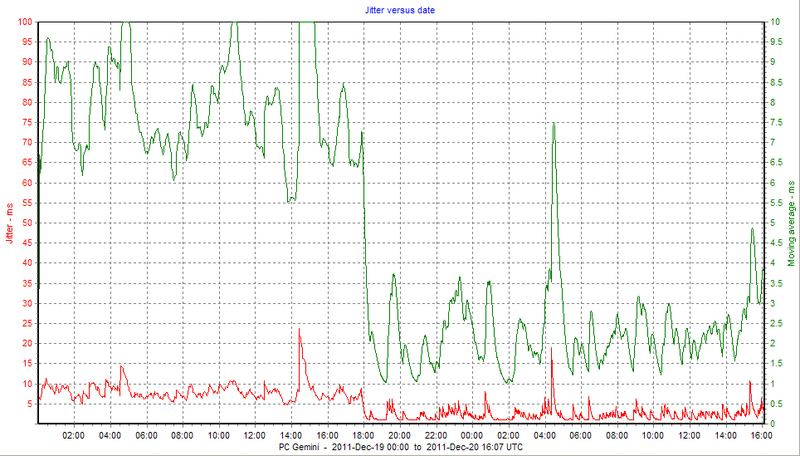 Averaged jitter dropped from 6.5 ms to 1.1 ms. Jitter slightly higher at 1.25 averaged after 24 hours. Offset now much smaller and more "noise" like. 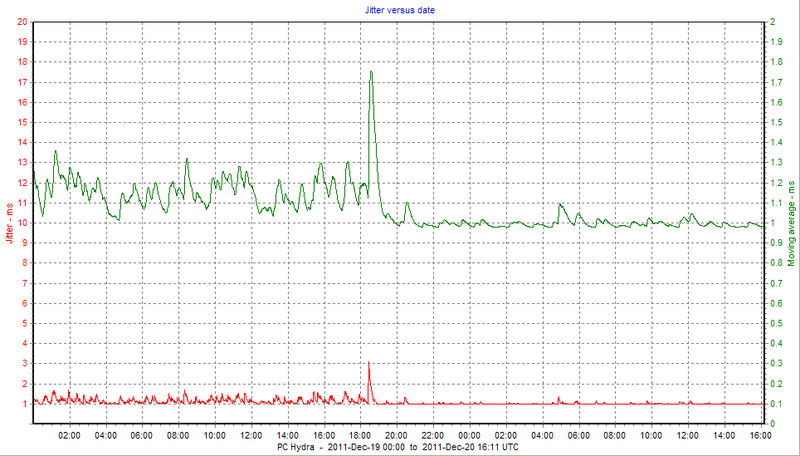 RMS offset dropped from ~5 ms or more to ~0.5 ms, increasing to ~0.7 ms after ~24 hours. To: ntpd 4.2.7p238-o Dec 10 4:46:28.43 (UTC-00:00) 2011 (1) No obvious change? Averaged jitter 15..25 �s. 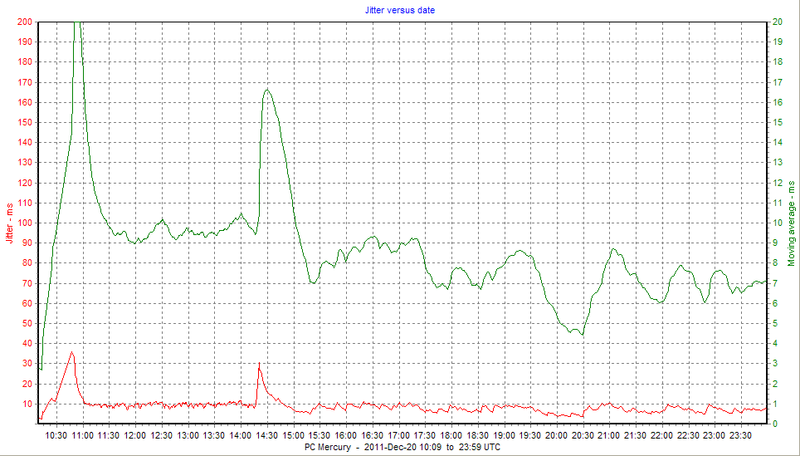 Immediately after the change both offset and jitter seemed slightly less, but returned to the pre-change values after 10-12 hours. 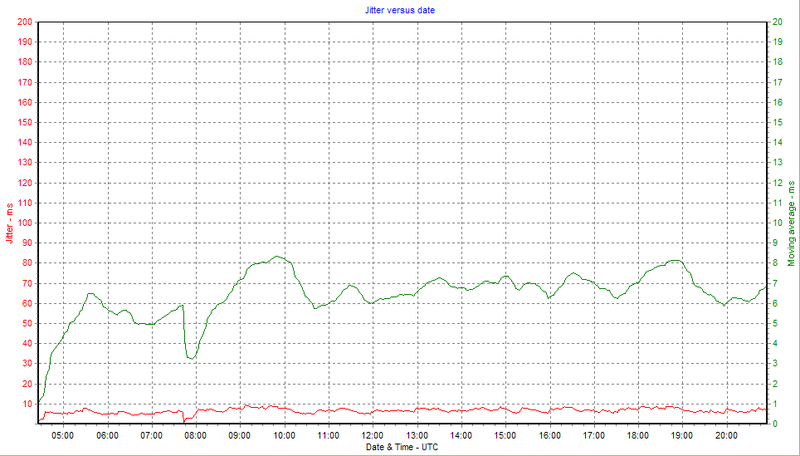 11:17 To: ntpd 4.2.7p241-o Dec 18 22:57:49.91 (UTC-00:00) 2011 (1) No obvious change. Averaged jitter 16..23 �s. RMS offset may have increased slight from 13 �s to 15 �s. making NTP's job difficult, if not impossible! 09:00 Changed to LAN connection. To: ntpd 4.2.7p241-o Dec 18 22:57:49.91 (UTC-00:00) 2011 (1) Averaged jitter went from something in the 7.5 ms region, down to just under 1 ms. Offset changed from peaks of +/- 3 ms, to a steadier value with an RMS of ~0.25 ms, but also with a period component of about one cycle per 22 minutes. To: ntpd 4.2.7p238-o Dec 10 4:46:28.43 (UTC-00:00) 2011 (1) No obvious change. Averaged jitter 3-7 ms. Offset is asymmetric +9/-13 ms.
ntpd 4.2.4p6@DLH-QPC-o May 30 3:58:32.88 (UTC) 2009 (273) Much better Averaged jitter dropped from 5-5.5 ms down to ~1.3 ms. 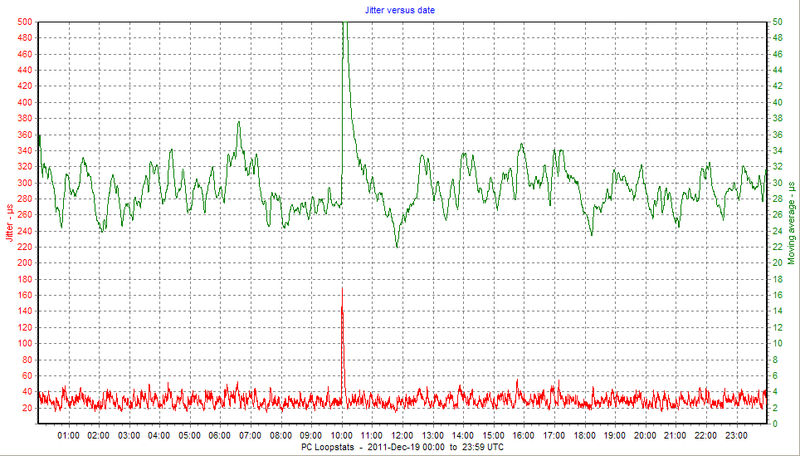 Offset had a much higher frequency appearance, of a much lower	amplitude (4.8 ms RMS dropped to ~1.0 ms RMS). 07:46 To: ntpd 4.2.7p238-o Dec 10 4:46:28.43 (UTC-00:00) 2011 (1), for start of test run. Averaged jitter 1.5 - 6.5 ms, very variable. 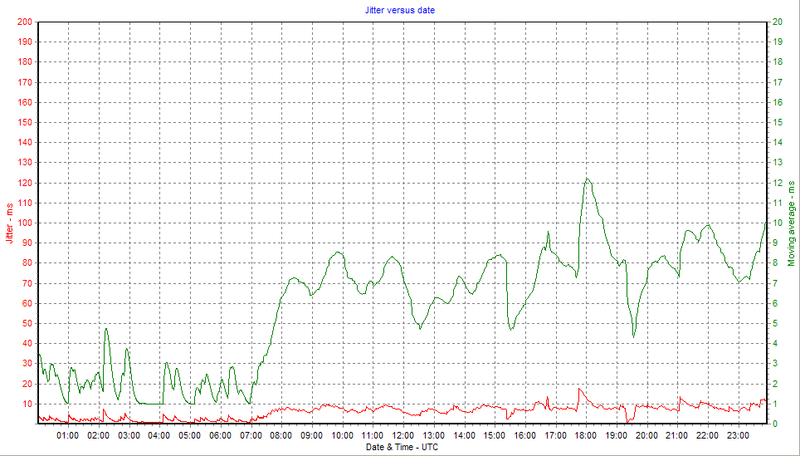 Offset very spiky, +8/-10 ms.
09:55 Turned off IPv6 on the adapters. No change. 10:25 Rebooted with just a LAN connection. Much better. Averaged jitter just over 1 ms. 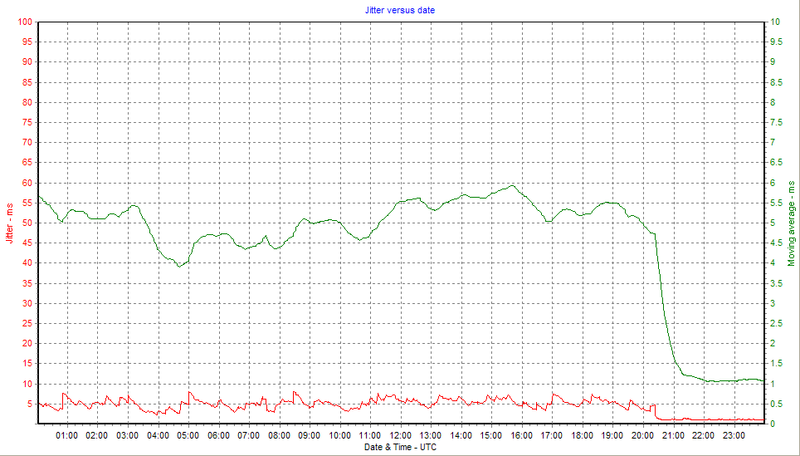 Offset reduced to mostly + 1.4/-0.7 ms, around 0.4 ms RMS. 14:35 Rebooted with just the Wi-Fi connection. Little change. Eh? (not plotted). Averaged jitter just over 1.1 ms, initially, but it increased to about 5 ms after about 50 minutes, and looks more stable there. Offset became increasingly wild, up to at least +/-3 ms.
Summary: Dec-10 at 07:11 update from p214 to p238 produced no noticeable change. Summary: Dec-19 at 09:59 update from p238 to p241 produced no noticeable change. Summary: Dec-10 07:29 updated from p214 to p238, no significant change. Summary: Dec-19 07:33 updated from p238 to p241, no significant change. 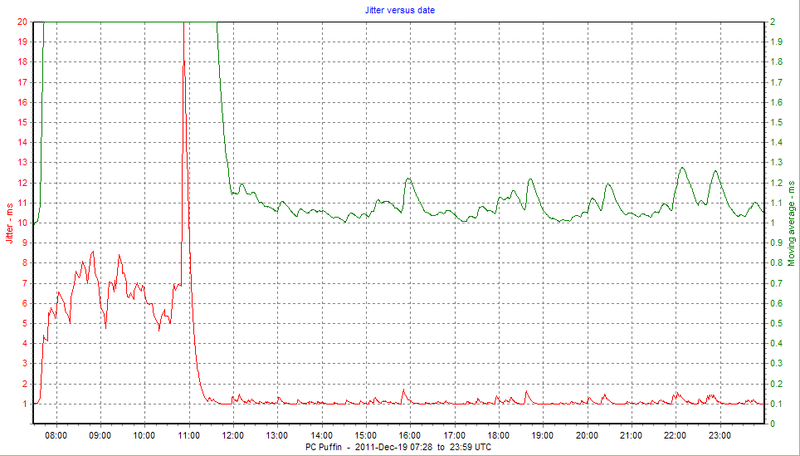 Summary: Dec-10 14:55 from 4.2.4p6(273) to 4.2.7p238 resulted in much poorer performance, so reverted at 19:11. Summary: Dec-20 14:23 from 4.2.4p6(273) to 4.2.7p241. No significant change, previous good performance retsined. Summary: Dec-10 07:47 from 4.2.7p213 to p238 - no noticeable change. Summary: Dec-20 11:20 from 4.2.7p238 to p241 - no noticeable change. Summary: Dec-10, 4.2.7p213 to p238 update at 07:23. Reverted to p214 at 19:19, but unable to restore previous performance? Summary: Dec-19 at 17:51, update from p214 to p241, and previous performance restored. Offset graph now noticeably different. Summary: Dec-10 07:34 from p237 to p238, no change. 20:23 back to 4.2.4p6(273) to restore good performance. Summary: Dec-19 18:25 from 4.2.4p6(273) to 4.2.7p241. Improvements in jitter and RMS offset. Summary: Dec-19 07:52 from 4.2.4p6(273) to 4.2.7p241. 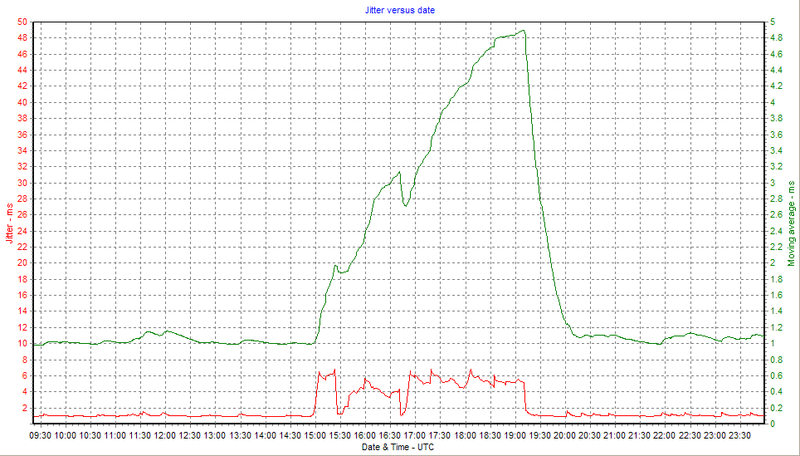 Slight improvement, but look at the offset and frequency graphs. Summary: Dec-19 07:52 from 4.2.7p214 to 4.2.7p241. Noticeable improvement. Summary: Dec-10 07:52 from 4.2.7p214 to 4.2.7p238. No significant change. Summary: Dec-19 07:17 from 4.2.7p238 to 4.2.7p241. No significant change. Summary: Dec-10 07:43 from 4.2.7p237 to 4.2.7p238. Summary: Dec-19 07:43 from 4.2.7p238 to 4.2.7p241. Great improvement. Summary: Dec-10 07:17 from 4.2.7p214 to 4.2.7p238. Summary: Dec-20 11:17 from 4.2.7p238 to 4.2.7p241. Summary: Dec-19 10:36 from 4.2.7p238 to 4.2.7p241. Summary: Dec-10 05:52 from 4.2.7p237 to 4.2.7p238. Summary: Dec-19, 07:46 switched to 4.2.7p238, 11:22 to 4.2.7p241, Dec-20 10:25 changed from Wi-Fi to LAN connection and got even better performance than when running on p238.